Hosta Minuteman Cuts a Clean White Path Along the Edge of Every Leaf! 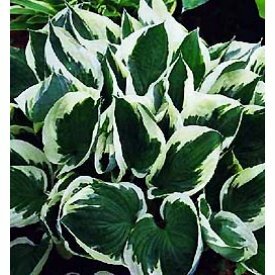 Our choice for the best white-margined Hosta Perennial Plant Zone: Zone 3, Zone 4, Zone 5, Zone 6, Zone 7, Zone 8, Zone 9 Size at Maturity: 1 - 3 ft, sizes vary at time of shipping, shipped with some dirt in tact other wise bareroot. ever developed! What's the point of variegation if you have to get right on top of the plant to see it 'Minuteman' takes matters into its own hands with the widest, whitest, cleanest edging I have ever seen on a Hosta. The result is a plant that stands out across the garden -- perfect for formal and informal designs alike!